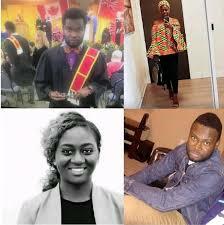 A 30-year-old Nigerian graduate named Onoseta Oribhabor has allegedly taken his own life shortly after murdering his 27-year-old girlfriend in Toronto, Canada. According to reports, Oribhabor was found dead on the balcony of a condo by the police. The incident happened on March 6 and the police stated that his girlfriend was found in another part of the house with obvious signs of trauma and abuse. After being treated, she didn't survive, making it a murder case. Reports suggests that Onoseta domestically abused his late girlfriend, Essozinam "Martine" Assali who was found with several injuries by the police before she gave of the ghost at the hospital. Late Onoseta was said to have graduated from a top Nigerian university before he left for Canada. The police recorded the case as a murder-su*cide, stating that the deaths were a result of domestic incidents, eliminating any further investigation. May the soul of the departed rest in peace.